The Parkington Sisters – with Rose on guitar and piano, Ariel and Sarah on violin and viola, and Nora on percussion and violin – and all four sisters singing in hypnotic harmony – make music full of magnificent sorrow, evocative of where they come from, Wellfleet, on Cape Cod, a place of crashing waves, gnarled pine trees, and a town clock that still keeps nautical time. 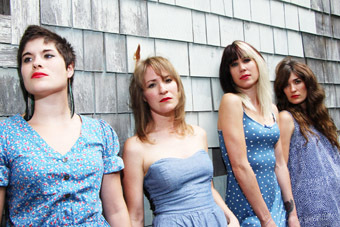 Provincetown Magazine praised their “beautiful folk harmonies and warm, mournful vocals” as well as their “moving melodies that plum the depths in a kind of glorious melancholy.” The weight is lifted, though, when their inevitable sisterly banter and joking come out, creating a perfect balance of tension and release in their live show. “They can feel at home in front of a rowdy rock crowd at the House of Blues, but just as easily adapt to the sophistication of Symphony Hall,” says the Boston Globe. They play for a wide range of audiences, opening for Mavis Staples one night, and for punk rockers the Dropkick Murphys another. Their debut album, Till Voices Wake Up, explores the darkness but also the hope of each new day, the light in September, the geese flying north, the deer dead on the highway, the struggle to move beyond. “The Parkington sisters have a collective magic, says the Cape Cod Times, “part chemistry, part alchemy, entirely mysterious.” Let go into the mystery with the Parkington Sisters.